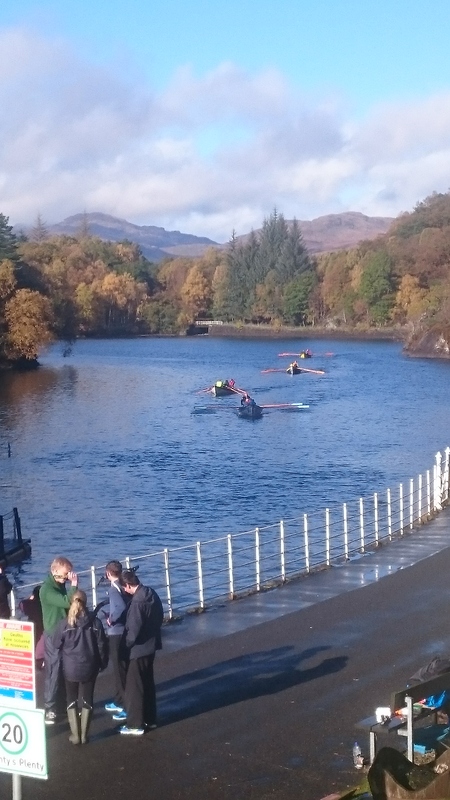 The Scottish Costal Rowing Association (SCRA the parent body for St Ayles skiffs worldwide) held its AGM last weekend and to add some fun for those who travelled from far and wide to attend, a series of Freshwater Sprints was held on the nearby Loch. 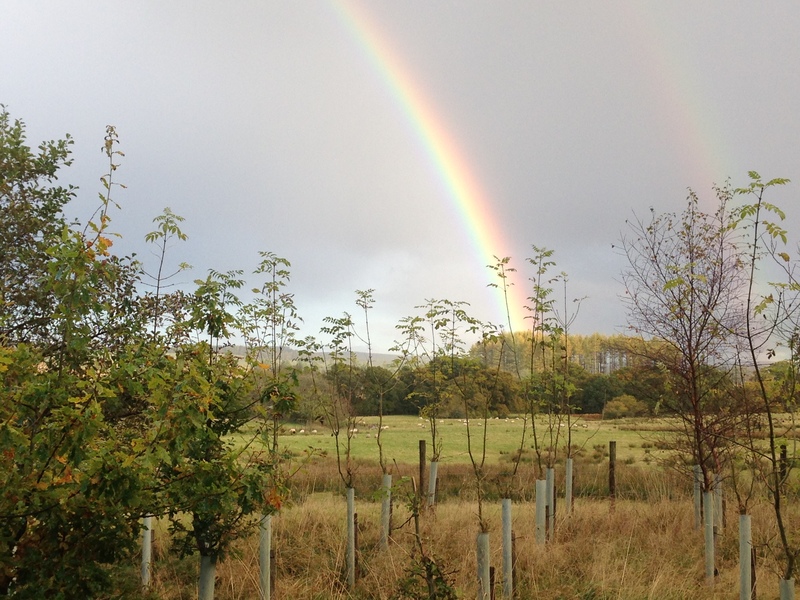 Spectacular at any time, when the sun shines, the scenery in the Trossachs is beautiful. 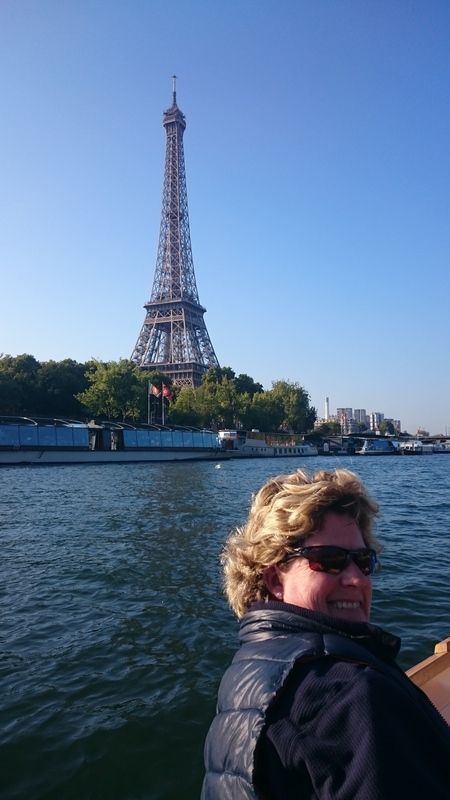 Our Captain and President represented CRAB at the AGM (not sure whether they rowed as well?) but Victoria and Mike travelled from Langstone to take part and sent these photos. Don’t be deceived, the catamaran is not overtaking the skiff. Our all-ladies crew is pulling hard in all senses of the word. All in a day’s training with CRAB. 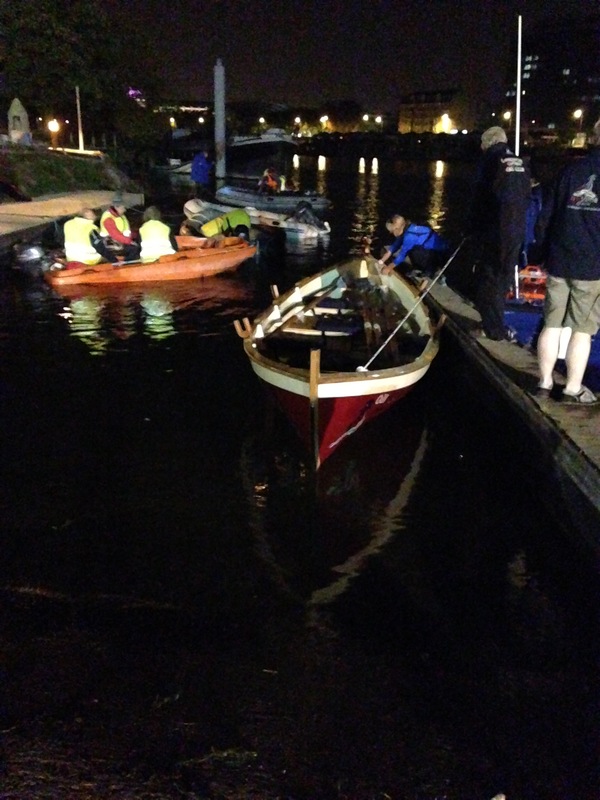 We were joined by a crew from Kings Lynn Coastal Rowing. 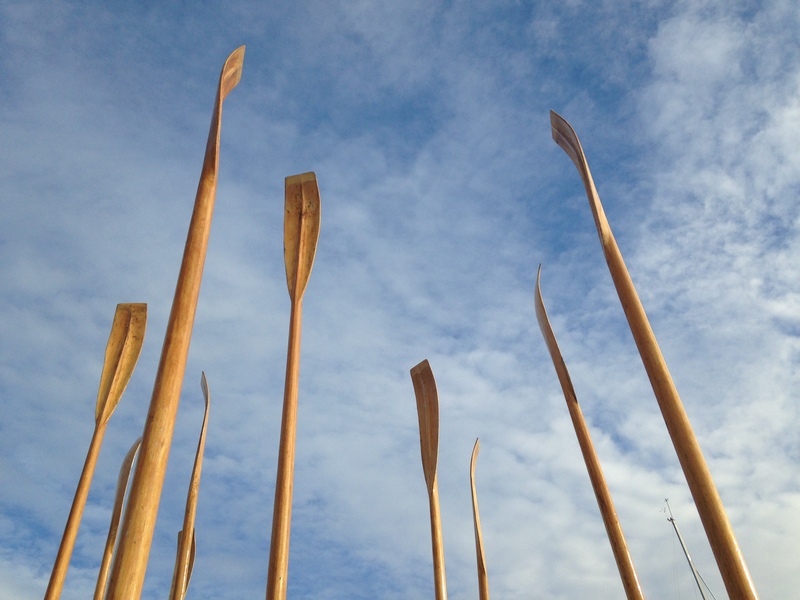 They didn’t bring their boat but had a great time trying out our new prototype oars. 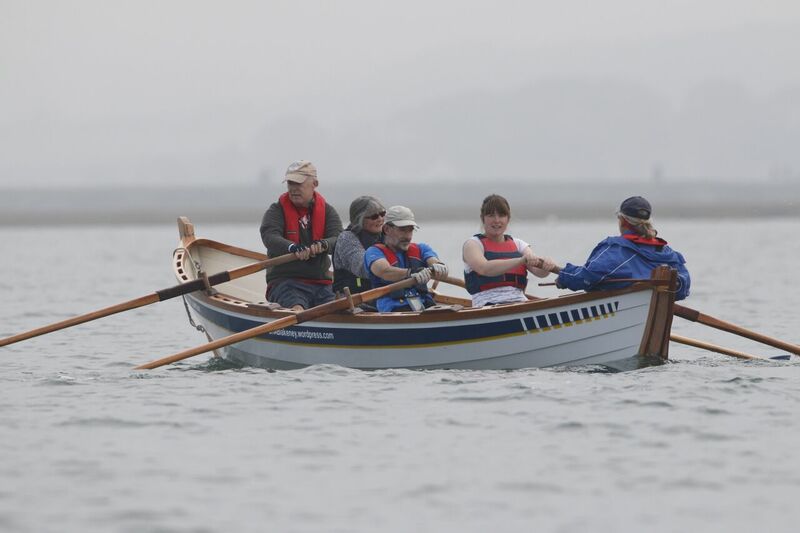 The general consensus is that the oars are better balanced and make it easier to power the boat along – but being long with wider blades, catching crabs can be very much the order of the day. 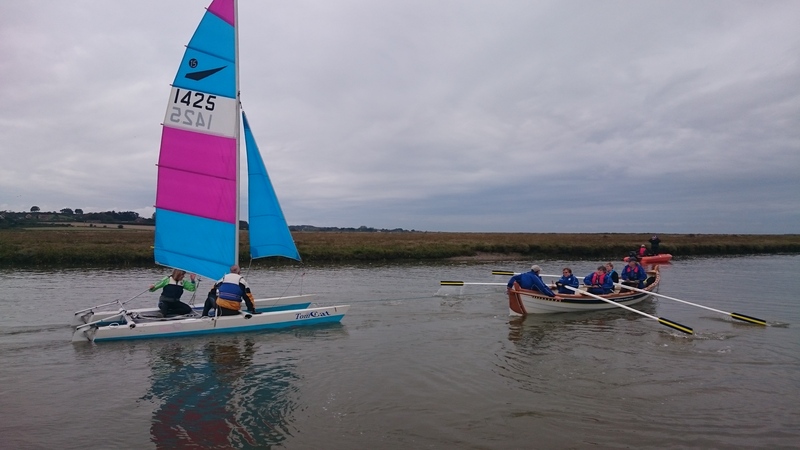 Not a problem in flat calm water, as in the picture above, but Saturday presented a challenge; rowing back against a fresh Easterly with a good old Blakeney chop, was guaranteed to catch the unwary. Particular thanks to Victoria and Mike for passing on their expertise throughout the weekend. 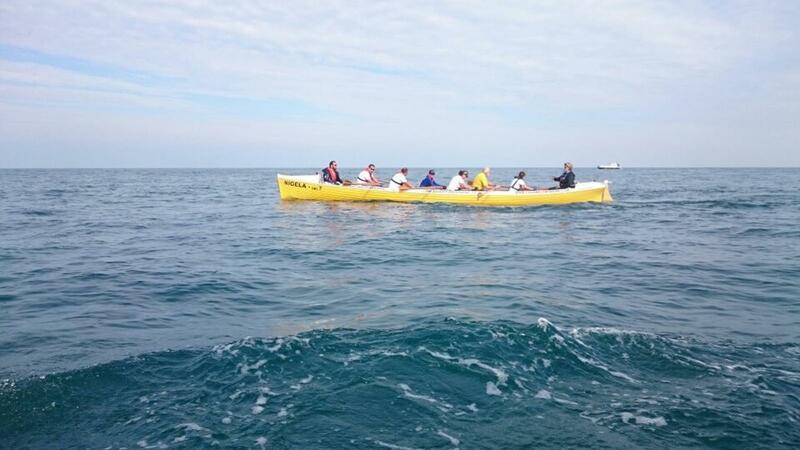 CRAB members travelled on from Paris to Jersey to assist Standard Chartered Bank to complete a challenge. They were set to bike twice round the island on day one, row round on day 2 and do the Jersey marathon on day 3. Ummm! Conclusion of the day, adventure gigs have the world’s hardest seats! 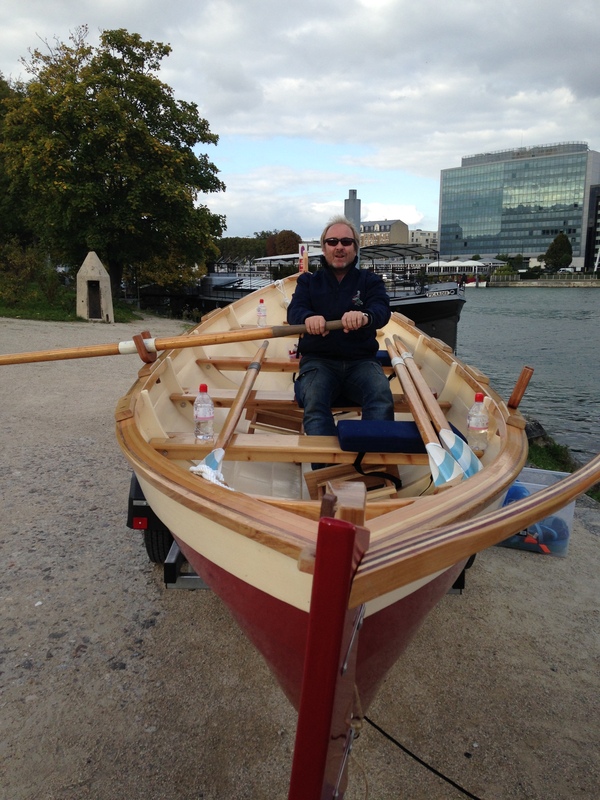 Oarsome Chance Ltd., a charitable foundation giving many youngsters (NEETS) the opportunity to get involved with the build of St Ayles skiffs then go out and row, set off to la belle France to tackle the Travesrsée de Paris. 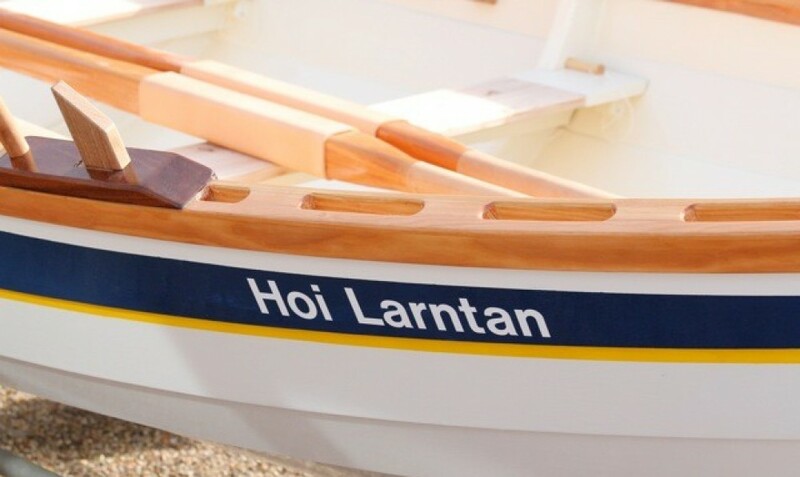 CRAB and Langstone rowers made up the numbers. Next step is to launch – at night! 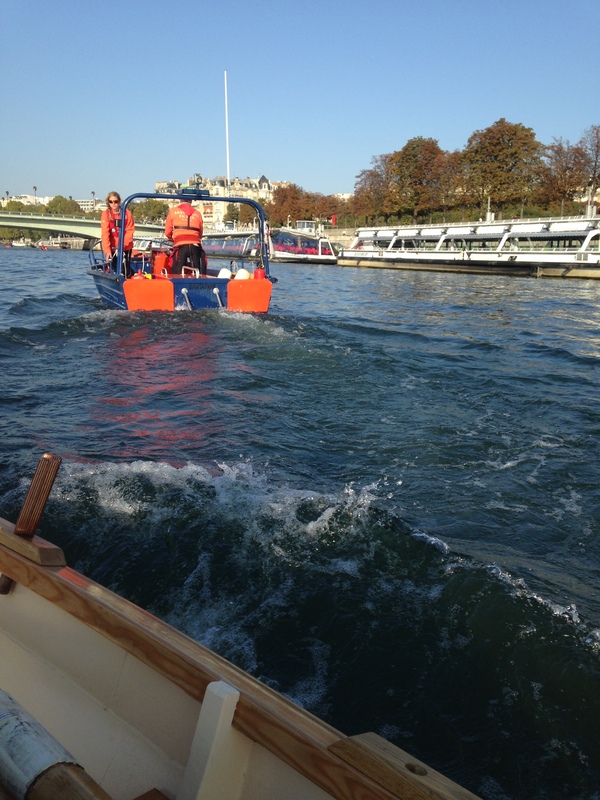 As a bonus, an excursion round the Ile de France – but broke the tiller and had to accept a tow back! Ah! 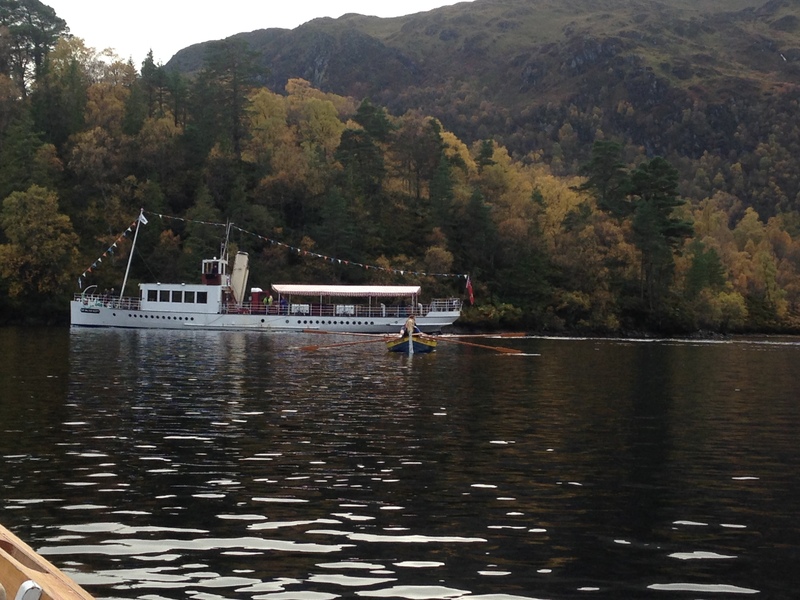 well, all in a days Skiffie rowing. Many thanks to David Horsley – local wild-life photographer – for catching this from Tom’s boat. The very end of September; chilly but magical. A short delay for the tide which decided to ignore the predictions and made us wait 40 minutes before we could launch – no real hardship, watching the wonderful sunrise. The peace was deafening. When it came, the tide was about the biggest so far this year. 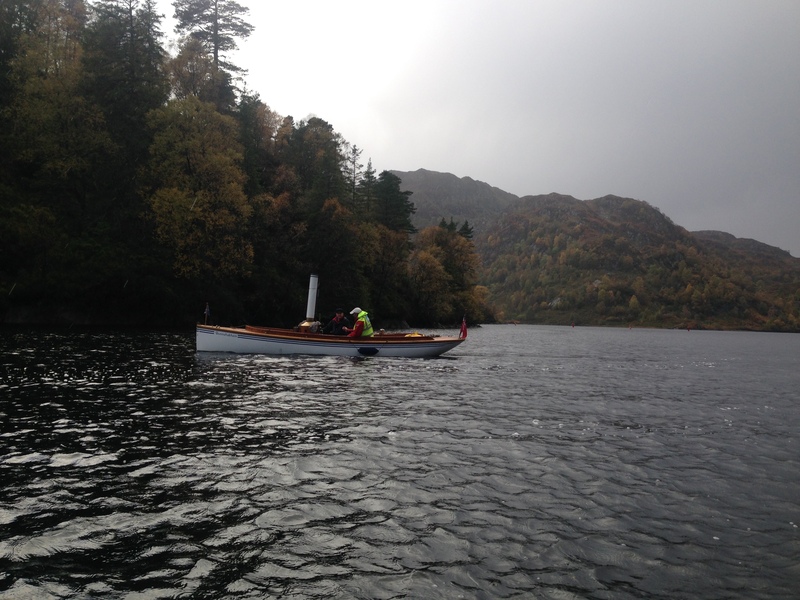 Rowing against it was tough, particularly into a brisk easterly on the way home. 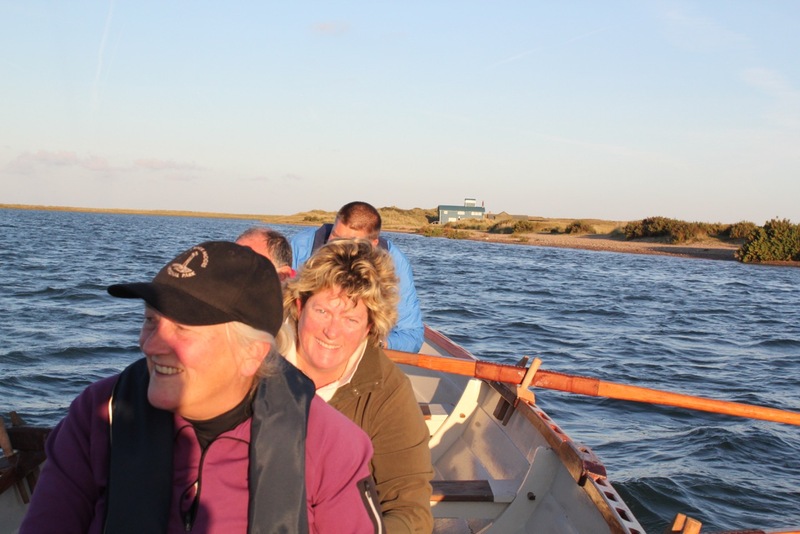 Where else in Norfolk but Blakeney Point, could we be out rowing and have a migrating Osprey turn up overhead as we approached the seal colony? 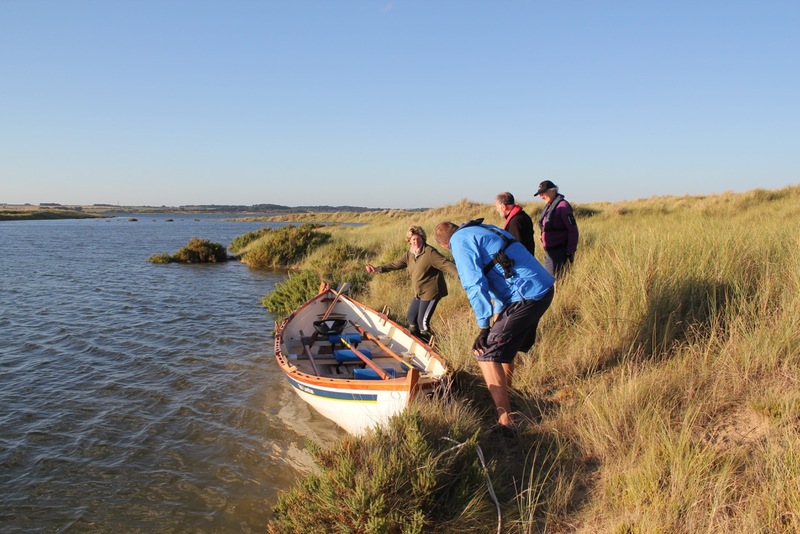 Able to row right to the edge of the dunes, twenty metres from the beach, we paused for our usual turn-round refreshments; strictly coffee and biscuits, nothing stronger – honest. One of this year’s great memories. Thanks to Tom for pictures and the idea.